Winslow leaps joyously into the truck to go with me every day to the studio. At a year and a half old, he still has a lot of the pup in him. When we come through the door, his daily routine is to grab his old chewed-up plastic milk jug and run as fast as he can through all the rooms. Winslow loves to chew. I've had to "kid-proof" the studio, as in the past he has sunk his sharp little canines into paint tubes, gnawed the handles off brushes and shredded his sleeping blanket. But when given one of those expensive little pet store treats designed for dogs to whittle on, he promptly and furtively hides it in a dark corner--never to return. The other day I found the mangled remains of my college diploma scattered across the floor. I haven't a clue where he found it--haven't seen it myself in twenty years. It occurs to me that if Winslow had been around back in my school days, I could have kept a straight face while telling teachers my dog ate my homework. 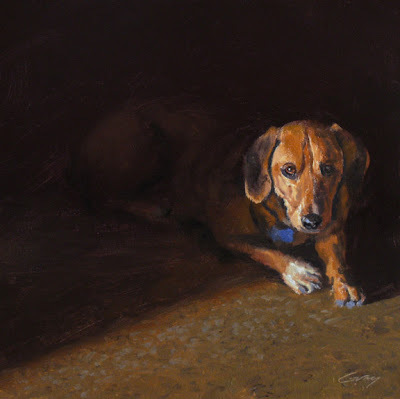 When he is through with the chewing and running around for awhile, Winslow sometimes settles himself in the dark and quiet at the far end of the hall near the door, mustering as much patience as he can, while waiting for his master (master...now that's a laugh!) to take him for a walk. a beautiful tribute to a right little mite! just love the handling of light ad splashes of blue. and the story was a delight to read. I agree.. I like these little sagas behind the painting. It puts a whole new light (no pun intended) on the subject...I can almost see some mischief in his expression. Pablo and Winslow.. am I noticing a theme in doggy names? My first impression was the composition. I think it is perfect. Love the story about Winslow. Thanks, Simon. Yes, you do a beautiful job with those shadowy, indistinct forms. Hi Rahina--thanks for checking in and for the nice comments. Winslow (Homer.) For a short time we had a Maya (Angelou) but she found an open gate and we never saw her again. I appreciate your kind comments, Joanne. I always enjoy your paintings and writing. I'm a new subscriber to your posted paintings and wanted to say how gratified I am that you "admit" to working in more than one style. It's so frustrating to have certain galleries and critics who want all the work to look the same. In fact, not just the same - but almost the same painting! I've been painting for thirty plus years, and I don't want to hear some dilettante tell me my work is "not mature" because I like to work on differing series of things. I think that kind of constraint is dated. When I look at your work overall, I see brushwork akin to handwriting. I see a way of dealing with form and color, drawing and planes that is yours no matter what you paint. Thank you for being a inspiration - and for daring to buck the system. And by the way,love, love, love your animals. Patrice--welcome to my blog. What wonderful, eloquent thoughts--I'm so glad that you said them--thank you! I absolutely love the composition here. Having Winslow coming out of the shadows looks very, very cool!